Our first theme will be, appropriately, Firsts! Expect to see more pop culture recommendations based around the theme Firsts throughout the upcoming week. When I sat down to think of my pop culture “firsts,” a number of artifacts flew through my mind. I could talk about the first time I ever listened to good music (I was 16, Yellow Submarine), I could talk about the first time I truly realized the power of the radio as a medium (listening to Testosterone, a powerful, still-resonant episode of This American Life), or the first time I actually felt something while playing a video game (Ico). Instead, I find an opera calling to me, its lavish, over-the-top, spectacle telling me that it is the only logical choice. 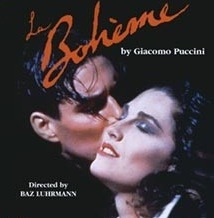 I am speaking of the Baz Luhrmann production of La Boheme. In my senior year of high school, my humanities teacher chose to expose his students to the world of opera by playing selections from Bizet’s Carmen. When I heard the Overture and Habanera, my thoughts were, in succession, “This is great! I feel like I’ve heard these tunes somewhere before,” (because, of course, who hasn’t) “I should check out some other operas!” I was in full-on musical theater nerd mode at this time of my life. Have you seen Glee? You could have transplanted me into that show pretty easily at this point. I was obsessed with Rent and had just seen Moulin Rouge for the first time, so you can imagine my reaction when I find a VHS copy at my local library of Lurhmann’s La Boheme. Visually, the opening scene hooked me. 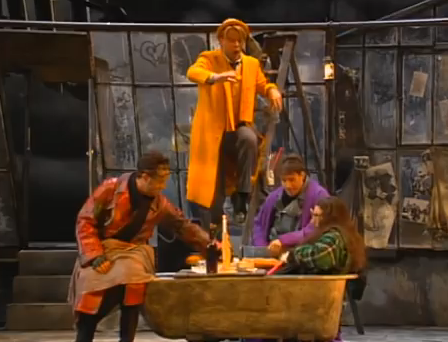 The design of the main characters’ costumes, as well as their squalid apartment is highly reminiscent of Rent, a comparison that really helped me follow along. Rent is a loose adaptation of La Boheme, so to see such a direct through-line to something that I was familiar with made this production feel comfortable to me, like I’m visiting an old friend who happens to live in a new home. That friend is more or less the same, but the details around them have changed somewhat. The fact that the story is so similar (artists living in poverty, navigating the world) to such a well-known modern musical is why I will refrain from delving deeply into the narrative of La Boheme here. In general, the design of this production is going to appeal to you if you are a fan of Moulin Rouge. The two Luhrmann works share a great deal of the same over-the-top flashiness. In fact, there will be times when you will feel that you are watching what could be a staged version of Moulin Rouge. While some might find these similarities off-putting, viewing this production with the feeling of walking into familiar territory really helped me engage in the world of opera, which I had been totally unfamiliar with up until this point. La Boheme, in general, is a great entry point into opera, but the Baz Luhrmann production is particularly good for newbies. Opera is one of the great artforms that seems to get neglected the most by modern audiences. If you’ve never seen one, start here. If you like Baz Luhrmann’s La Boheme, check out: Julie Taymor’s production of The Magic Flute. It’s another great entry-level opera with unbelievable spectacle. See for yourself. The Rec Room is a new pop culture recommendation blog that promises unique suggestions of culture that you’re guaranteed to love. Our recommendations will be based on themes that will change weekly. If you’d like to write recommendations, feel free to send us an email at therecblog@gmail.com.